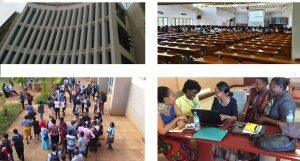 This is the first of a series of blogs from Maaike Duine on a pilot project which aims to increase the quality of academic publishing in Tanzania through the creation of a consortium of academic publishers and through training, skills development and capacity building. The project is a collaboration between Voluntary Service Overseas (VSO), the Tanzania Commission for Science and Technology (COSTECH) and INASP. It is the first time that INASP has been involved in an extended and integrated set of activities to enhance academic publishing in a single country. 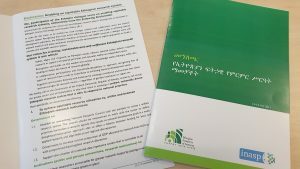 Through this blog, Maaike, the VSO Professional Volunteer will document her own experiences throughout the project as well as the progress and outcomes. “Tanzania is looking for a publishing advisor”. In September 2013, this vacancy posted by VSO drew my attention. After reading the job description and the goals of the two –year project “Strengthening Indigenous Academic and Digital Publishing in Tanzania”, I decided to apply. Although I liked my life in the Netherlands and enjoyed working for the international publishing company Springer, I was looking for a more challenging position and change of scenery. I had been thinking about moving abroad before but never saw a good opportunity and this definitely was! Assisting in the set up of a consortium of Tanzanian academic publishers would bring many challenges and opportunities, and living in Tanzania seemed very appealing with the beach, mountains, wildlife and lots of sunshine. After a talk with the previous VSO volunteer and an assessment, it was for sure; I was moving to Tanzania! Before I could leave there were many things to be done: VSO Netherlands organized training on developmental work, cultural differences, communication and fundraising; a physical examination, as well as vaccinations were necessary; my apartment had to be emptied and stuff put into storage; I organized a climbing clinic to raise funds for VSO and, the hardest part, saying goodbyes to my family, friends and colleagues. On January 6 my plane landed from Amsterdam with stops in Nairobi and Zanzibar. I was picked up by the driver from VSO and on my way to my hotel, I already got a glimpse of Dar’s vivid city life. People try to sell all kinds of stuff when you are waiting in traffic, this varies from ice cream, fruit and magazines to brooms and coat racks. At the main intersections, police officers try to arrange the traffic and this isn’t an easy job! Cars, dalladallas (mini buses), bajajes (motorized tuktuks), people on motorbikes and a few on bikes are all on the same road, trying to get wherever they go as fast as they can. People are overtaking whenever possible without taking into account the correct side of the road but by claxoning as loud as they can. Crazy! The apartment I share with another VSO volunteer is located in Msasani, on Dar es Salaam’s peninsula. The building is on an unpaved street just off a very busy main road. Alongside this road, there are many small shops selling fruits, vegetables, meat and clothes. But there are also pharmacies, hair dressers and even an optician. During the evening, many restaurants are offering street food such as kuku (chicken) and chips. The pans are on open fires and fish, meat and corn is being grilled on barbecues with people gathering around them. Even at night, in this season, the temperature never drops below 25 degrees. There has already been some heavy rainfall, and when this happens, the road to my apartment changes into a muddy river. On 7 January 2014, Mr. Jean Van Wetter (Country Director, VSO Tanzania), Dr. Hassan Mshinda (General Director, Commission for Science and Technology), Mr. Ian Ben Moshi (Chairperson, Publishing Association of Tanzania), Mr. Walter Bgoya (Chairperson, Book Development Council of Tanzania) added their signature’s to INASP Executive Director Sue Corbett’s on the Memorandum of Understanding (MoU) for the project. The representatives were thrilled about the opportunities the project offers Tanzanian publishers and researchers. 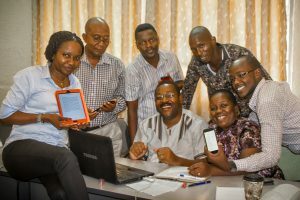 The possibilities of digital publishing were featured in the Tanzanian Media with an article in The Citizen focusing on some of the advantages of digital publishing, such as cost reduction of printing and distribution. The signing of the MoU was also broadcast by the Tanzanian Television. The next week my desk at the Commission for Science and Technology was ready. It took me a while to figure out how to get there and one of the first days I got completely lost when I took the dalladalla — that wasn’t much fun as dalladallas are usually packed with people almost hanging out of the windows. But, on the other hand, what luxury can be expected for a trip that only costs about 20 Eurocent. I am still thinking about buying a bike to get to work. In Holland, I used to cycle almost everywhere. Although I’m not really sure if I can adjust to the hectic traffic over here, with no biking lanes. At work I am sharing a nice office with Philbert, who is responsible for the open forum on Agricultural Biotechnology in Africa (OFAB). In the first months I will get to know all the stakeholders involved and I will have meetings with publishers in Tanzania to assess the level of academic publishing in Tanzania. In my next post, I will talk more about Tanzania’s publishers, Zanzibar and chimpanzees.